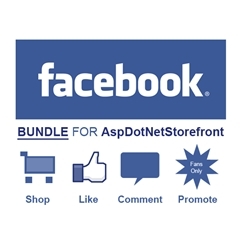 Allow your fans to shop on your Facebook page. Become a fan, and get exclusive fan only offers. Use this add-on to offer rewards to Facebook users to be-fan your page! Use this add-on to put the Facebook Like badge on your product pages. Use this add-on to put the Facebook Comments on your product pages. Click here for more information on the exciting new world of Facebook commerce. Installation is included with purchase of this app.